Lavender of lavendula is actually a genus of over 40 species of fragrant flowering plants belonging to the Lamiaceae mint family. Lavender which is a native of the Old World can be found growing in large parts of the Mediterranean and Europe, North and East Africa as well as South West Asia and India. Lavender is cultivated in temperate climes as an ornamental plant for use in the garden and as a culinary herb. It is also cultivated to extract its essential oils and is among the most popular of all essential oils. Lavender essential oil is known for its incredible range of health benefits both mental and physical and its gentle action on the body. English lavender known scientifically as Lavendula angustifolia is the most cultivated of the species and is the plant most people are referring to when they talk about lavender. It is this species of lavender that you should purchase to make your tea. While lavender essential oil is incredibly well-known and popular throughout the world, its use as a tea is not as common. 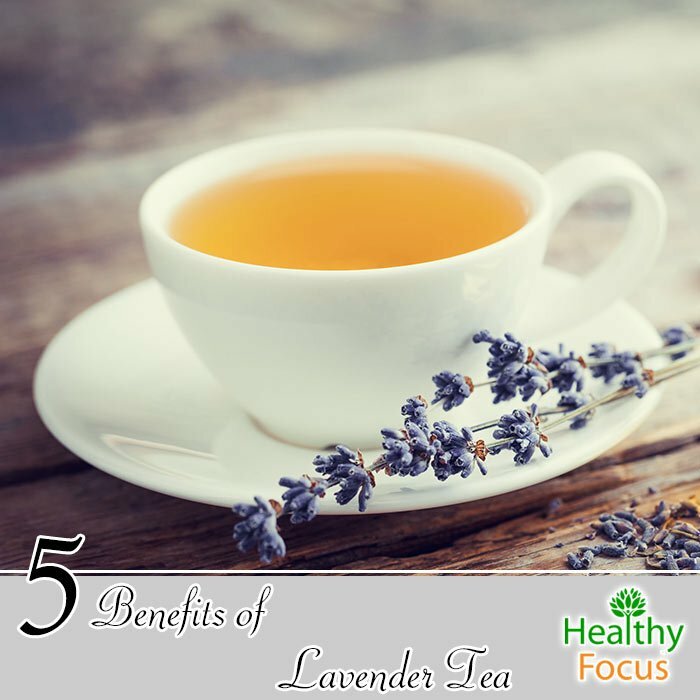 This article will take a look at the various health benefits that drinking lavender tea can confer and also tell you how to make it so you can enjoy all the benefits the plant has to offer. Lavender tea has calming qualities and is a great choice to soothe your nerves and encourage sleep. It is also carminative meaning it combats gas while it also contains antibacterial, antispasmodic, antiseptic and expectorant properties. If you suffer from indigestion, lavender tea can definitely help. Indigestion is a common problem that comes with a range of symptoms including abdominal pain, gas, nausea, vomiting and burning sensations in the stomach. It can be a sign that there is an underlying medical condition but it is not always serious. If you suffer from frequent bouts of indigestion, it is best to seek medical advice. Lavender has a well-earned reputation as a calming herb with the ability to settle the nerves and promote good sleep. While most of the studies into the effects of lavender have focused in its essential oils, there is good reason to believe that a cup of lavender tea may be equally as effective. Anybody who has suffered from periods of insomnia will be aware of the destructive effects it can have on your life whether it be your studies, your work or your relationships. Failure to get sufficient sleep can eventually have a marked effect on your physical health so trying herbal remedies like lavender tea can be a great option. According to a Korean study published in 2006, inhaling lavender helped relieve insomnia and depression in a group of 42 female university students. (2) Although this study involved essential oil, the same aromas are released when the plant is exposed to hot water and you can take advantage of its vapors when drinking the tea. Many herbal teas have a great calming effect on the mind and lavender tea is no exception. Drinking the tea when you are feeling stressed can help you relax after a hard day at the office or the home and put your mind in the place it needs to be. There is no guarantee that lavender tea will have the desired effect but research into the effects of the essential oil on stress are very positive and the tea may well do the trick. It is certainly worth giving it a go. When you drink lavender tea, you will benefit from the essential oils released and these can help to relieve headaches and migraines. There is little evidence that lavender tea works on headaches but there is plenty of evidence that lavender essential oil is extremely effective. While the research done to date has focused on lavender essential oil, there is good reason to believe that drinking lavender tea may have a similar effect. Lavender tea and lavender oil has anticonvulsant and antispasmodic properties which can help treat a person suffering from uncontrollable convulsions. Convulsions are the uncontrollable shaking of the body caused by the rapid contractions and relaxations of the muscles. After a long and stressful day, you may very well be tempted to reach for a glass of your favorite wine, but why not give lavender tea a go instead. I am not saying that a glass of wine is necessarily bad for you but there is plenty of evidence that lavender tea is a better option. This is especially true if you find it difficult to relax of an evening and find sleep difficult to come by. The best way to consume lavender is to brew up a tea made from the plant’s buds. Brewing the flower buds in the form of a tea helps to release the therapeutic oils and fragrances. Making your own lavender tea at home is fairly straightforward. Simply get hold of some lavender and follow these easy steps. Boil up around 8 ounces of water. Put 4 teaspoons of lavender buds in a sachet. Put the sachet in a teacup or mug. Cover the sachet with water and steep for at least 10 minutes. If you do not have a sachet, just put the water in the loose buds and strain before you drink. Try drinking a cup every evening before going to bed. Drinking lavender tea in moderation is probably safe and very unlikely to have any serious damaging effects. According to several medical websites, ingesting lavender whether in tea or oil form can lead to various adverse side effects including headaches, constipation and an increase in appetite. People scheduled for surgery, should avoid drinking their lavender tea at least two weeks prior to surgery. This is because drinking the tea can slow down the body’s central nervous system. According to a study published in 2007, lavender oil can cause a condition called prebubertal gynecomastia which causes breast growth in male children. Pregnant women and those who are breastfeeding should always consult their doctor before taking any herbal remedies and lavender tea is no exception.